WBSSC Syllabus 2018 - WBSSC Exam Pattern HM, Clerk, Gr.D IndiaJoining.Com – Govt Jobs, Sarkari Results and Much More! Check and see the WBSSC Exam Syllabus 2018. 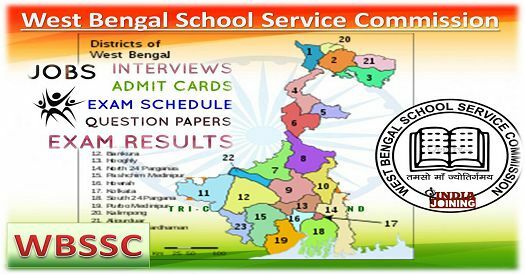 West Bengal School Service Commission was established for the purpose of recruitment of Assistant Teacher and Headmasters in recognized Non-Government aided Schools in West Bengal. Later the selection of Non-Teaching Staff in the posts of Librarian, Clerk and Group-D Staff including Lab Attendant, Peon, Night Guard, Matron in recognized Non-Government aided Schools also included in the duties of WBSSC. This page provides the latest examination syllabus of WBSSC for the posts listed below. Download newly adopted structure of examination, syllabus and WBSSC Exam Pattern at here.